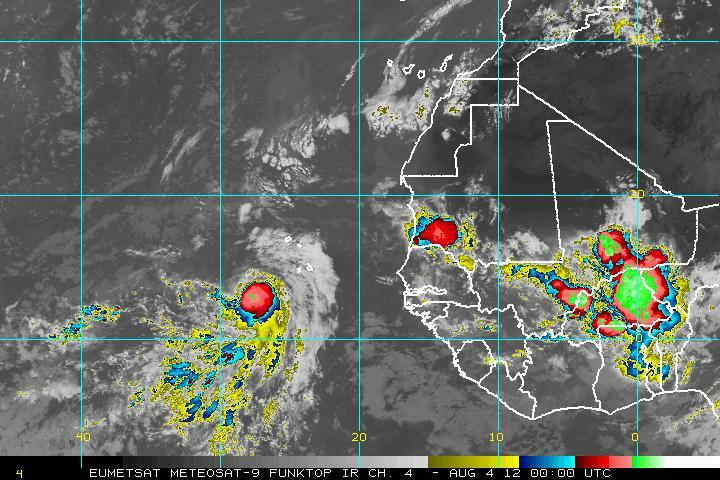 Somebody turned the tropics switch on this morning, and it’s only getting busier out in the Atlantic. I’m going to spend most of my time on Ernesto and newly designated Invest 91L, which is off the coast of Florida since they are of population impact. Invest 90L out in the far east Atlantic is very well-organized and may become a tropical depression tonight or early tomorrow morning as a Cape Verde system. As a special reference, there has been four tropical systems in the last two weeks in the west Pacific, and all of that energy moves its way eastward this week, and does not peak until mid month. A busy couple of weeks is ahead. Tonight’s recon flight was called off likely due to mechanical problems. 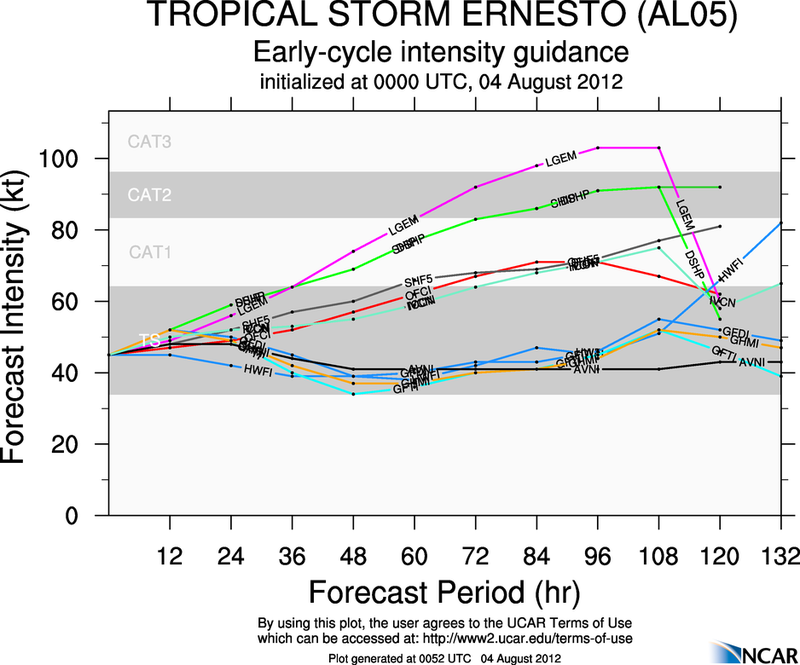 Earlier recon flights showed that Ernesto is back up to 50 mph, but the intensification phase may not be over. Over the last few hours, Ernesto has convected its largest burst of thunderstorm activity to date and outflow to the north has improved quite a bit. Ernesto is reaching the edge of the speedway that was the southern side of the Bermuda High and has slowed down just a bit. By tomorrow afternoon, Ernesto will be moving into the very warm waters in the central Caribbean. Westerly shear continues to hinder intensification, but not by much. Ernesto now likely has winds of 60 mph and a pressure around 1000 millibars with a forward motion of 21 mph toward the west. My reasoning in track forecasting remains the same, however with the recent convective burst I would have to shift my forecast a tad to the north. Westward motion should continue over the next 48 hours with a turn to the WNW happening on Sunday. Ernesto will be passing south of Jamaica similar to the NHC forecast path, and at this time my entire track is similar to the NHC forecast thinking right now with the exception of Day 5. By Tuesday, Ernesto will land itself in an area with steering currents that will only push him along at 10 to 12 mph toward the WNW, which will allow for intensification on the warmer waters of the western Caribbean. I am still not as robust on hurricane intensity, but I do now think that Ernesto will become a hurricane somewhere after it’s pass of Jamaica with winds of 75-80 mph. We have to look at the possibility that 91L will be in the Gulf, which will limit the moisture flow in that area. Even with my southern forecast, I think there will be some minor impact. Throw in the Yucatan peninsula, which I am forecasting a landfall upon on day 5 on the central Yucatan. Bottom line is that slow intensification will occur during the next three days with a possibility of increased intensification beyond that with landfall on the Yucatan on day 5. I have attached the latest intensity models and the latest satellite image. What concerns me with the model plot are the two models on the top of that chart….LGEM and DSHP…two good intensity models. This is a medium confidence forecast…65%. All tropical storm watches and warnings have been expired, but rainy conditions on and off will continue across the islands for the next day or so due to the increased outflow. 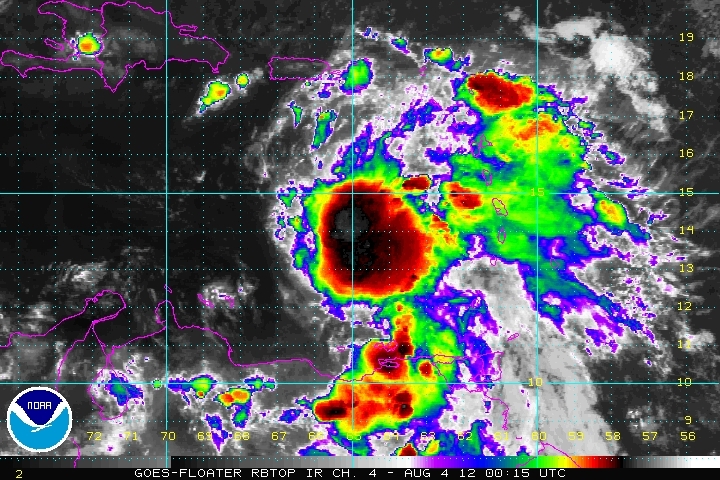 This system is VERY close being a new tropical depression. Just looking at satellite and it’s rotation, I would probably pull the trigger. NHC will be pulling the trigger either at 11pm tonight or 5am tomorrow morning unless something drastically changes. It has winds of 35 mph and a pressure of 1009 millibars. As I said earlier, I am not going to be spending a whole lot of time on this system, but models are showing a WNW motion for the next five days with no impacts on land. Slow intensification is possible with the system and it may gain the name ‘Florence’ by the end of the weekend. For a freshly hatched system, this system is very well-organized. Below is the most recent satellite image. 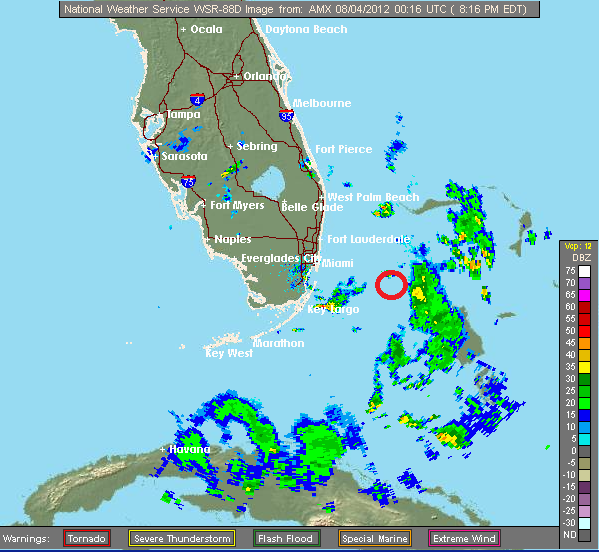 Posted on Friday, August 3rd, 2012, in Florida Weather, Tropical Weather. Bookmark the permalink. Leave a comment.